As a fan of the former Star Wars Expanded Universe, now the Legends continuity, it's inevitable that there are various characters and stories that I wish were still part of the main Star Wars canon. We don't always get what we want and I can totally respect why Disney had to do what it did once it had jumpstarted the movie machine for new sequels. But a guy can dream, right? Star Wars: Thrawn is a celebration of a dream many Star Wars fans like myself held onto but never really expected to come true. With the return of the Legends character of Grand Admiral Thrawn in Star Wars: Rebels, this also opened the door for new stories about him within the canon universe. And who better to write the first such story than the man who create the character - Timothy Zahn. This book helps cement Thrawn in the new canon universe and also adds new depth to a character that many fans have loved and have probably wanted to know a lot more about. And now we're starting to fill in those gaps with a great novel. 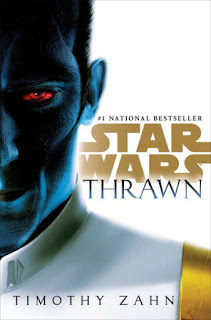 Synopsis: Star Wars: Thrawn is a science fiction novel written by Timothy Zahn as set in the current Star Wars canon. It is a prequel title that takes places a few years before the events of Star Wars: A New Hope and somewhat leads up to his later appearance in Star Wars: Rebels. The book tracks the Chiss individual Mitth'raw'nuruodo but better known as Thrawn in the conventional galaxy when he first makes contact with the Galactic Empire in a most unorthodox manner. His methods for sneaking aboard the Venator-class Strikefast. No one is able to understand him save for cadet Eli Vanto, who recognizes his species and manages to find a common language in Sy Bisti. The ship's captain recognizes the rather keen intelligence of Thrawn and decides to take him to Coruscant to present to the Emperor with Vanto acting as translator. The gamble pays off and the Emperor finds interest in Thrawn - more so when he mentions that he once met Anakin Skywalker. He decides to have him join the Imperial Navy but this means he'll need to spend some time at the Imperial Naval Academy to familiarize himself with how the Empire works and Vanto gets dragged along with him. Concurrently we also meet one Arihnda Pryce who finds herself in a difficult position given an effort by a rival to take over her family's mining operations on Lothal. She manages to strike a deal with Senator Renking that helps get her to Coruscant to start a new career while her family loses the mine to the Empire instead of their rival's. What I Liked: This is a two-for-one special that really prepares you for Thrawn's big debut in Rebels. We not only learn of how Thrawn managed to move up the Imperial ranks despite the practice of discrimination towards non-humans but also the story of how Arihnda Pryce managed to become Governor of Lothal by the tie the animated series comes along. But are rather fascinating characters and Zahn made sure to give both characters their spotlight moments and some interesting interactions as well. And this was important as it was Pryce who calls in Thrawn to help with her rebel problem on Lothal. And this book also manages to show Thrawn still being blindsided by political maneuvering behind-the-scenes as opposed to the more straightforward world of military conflict. So he still has room to grow as a character and we get to see him become even greater than who he was at the start of the book. But we still get to see him demonstrate his unique tactical perspective and we also get to experience him refining his techniques and expanding his understanding of art as he finds ways to use his insights to greater advantage. What Could Have Been Better: As much as there was a goal to paint Pryce in a rather negative light, at times it felt almost too one-sided such that she felt like a caricature of a person at times. The fact that she continually sells people out for personal gain all throughout the book does set a pattern but doesn't always make for great reading. I also hoped for more from Thrawn's obsession with the figure of Nightswan, who ends up being the focus of his attention later on. Nightswan is some mysterious tactician of sorts who aids various smugglers and criminals but to what end is not clear. We all saw where this was going even before we go there but the way that whole arc was managed didn't quite end well or at least didn't feel like a commensurate narrative payoff. TL;DR: Star Wars: Thrawn is a great opportunity to experience this already popular character in a new light. It helps expand on his back story and shows him on his to become the amazing military mind we all know him to be and then some. Thus the book gets a firm 5 political machinations by Arihnda Pryce out of a possible 5.